v3.5 of Multi Commander is now out. This version contains a lot of fixes and changes. Over 310+ changes. Windows Control Panels can now be launched from the Tools menu. Making it easier to find and start the different control panel. It is even possible to assign hot-keys to them. Another change is the Delete progress window. It will now show how much it is going to delete and how many items / MB is has deleted. This can be useful when deleting many files over a slow network. You can also configure the delete operation to continue on error. It will then not ask what to do if an error happens. And you can also configure it to always delete. If this is enable the delete operations will always try to delete files without asking. even if they are readonly, or other issue. This options can also be toggled from the delete progress dialog. But you will only have a change to change them there if you are deleting over a slow network. On local harddrive delete operation are often over in in seconds. File search has also got some minor UI improvments. It will remember what was entered into it between runs and you can now clear everything in the Find files dialog with a click on the clear button. The Regular expression engine is also updated. It is now using the engine that is included in the C++11 standard and that engine is more compatible to how regular expressions works in perl. So writing expressions should be a lot easier. You can now look for help online on how to write them. v3.1 is now out. Over 145+ changes has gone into this release. Most changes are related to stability and bug fixes. Also a lot of changes and clean up for the SDK. Making the SDK ready to be released. I been doing a lot of code clean up and refactoring in Multi Commander, I been updating a lot of the code to use new C++11 features, like lambdas, shard_ptr, uniqie_ptr , auto, ravlue and more. The result is a code that is much more cleaner, safer and it is much easier to maintain. I still got a lot of old style C++ left. But I will update the code class by class when I'm in changing and fixing bug in them. So more and more code will be updated. I also added rvalue support in my script engine. That increased the performance of the engine a bit. However I do not think anyone will really notice it since most script are very small. But everything that uses less CPU cycles is a good thing. The AWStats API is now starting to work. It is a simple php script that you place somewhere on you website and this script will return the AWStats data as json. 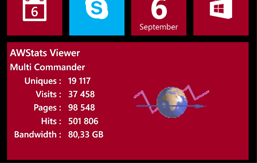 For my AWStats Viewer app for WP8 I need to be able to get the web statistic from the website some way. I do not want the app to parse the AWStats webpage since since it does not show all the information I want. I need the data from the AWStats data files. Not all of it but I need it unmodified. But the data files can be very large and having the app get fetch the data file and parse it is not a good idea. Because download several MB of data everything the app need to update is not god. It would be slow and require a lot of memory also background task have a memory limit. What I need is a Web API. I need to be able to send a query the website and have it return the result as JSON. The Webserver is running PHP so from PHP I need to read and parse the AWStats Data file and extract the information that is wanted and place create some JSON data from it and return it. I search the net for some PHP class that would parse the AWStats data and I found awparser that is made by Javier Infante. The AWParser class is not perfect, It does not extract all information I need and it stores the data in a way that is not optimal for my needs, But I will be able to modify it easily so I think I can make it work for me. After that I will have all the AWStats data in PHP arrays and php can convert arrays to JSON with json_encode(..) so it would be easy to return the data as JSON. So when I created this API I will publish the API on my website so anyone can install it on their own site if they want to develop own app for it or use my Awstats Viewer app in the future. 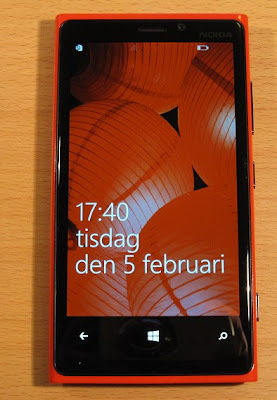 I had my Windows phone 8 phone for some time now. And I only done some small tests with developing for Widows Phone 8 and it was very easy to get started. But to really learn how to create apps on WP8 I need to create a complete app so I been trying to figure out what I should create. It does not have to be very useful for everyone. But it need to be something I would want to spent some time on and it should include network communication, Live Tile and some UI. After thinking about it for a couple of days this is what I come up with. I use AWStats get some of the web-statistics from my MultiCommander web site. And I would be great if I could get this stats in my phone. The problem is that AWStats does not have a web API. And I did not find anyone that created one so I would first need to create a way to deliver the data to the app. I think I will try to create an API that return the AWStats data as JSON. And then consume the JSON data in the WP8 app and then show the data. 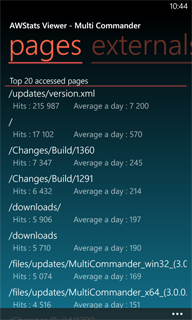 I also want a live tile that is update from a background task so I get some of the web-statistics directly on a tile. I Think I will call the app "AWStats Viewer"
So I need to start with the server side and investigate how I can return AWStats data from the site to the app. V3.0 of Multi Commaner is finally out. It was planed to be out a while ago but I had so much to do so it got a bit delayed. This released has over 360+ changes. Most changes will not be noticeable since they are internal core change that has been done to prepare for feature that will be added in the future.